People praise Paul Greengrass for his sharp action directing and quick cuts. What he rarely gets credit for is that he is the rare action director who realizes that there is no way to be prepared for tragedy. This is why “Captain Phillips” doesn’t start on a boat. It’s just another day, and just another mission for Captain Richard Phillips (Tom Hanks), who’s preparing for umpteenth mission as captain at sea. He drives with his wife (Catherine Keener) to the airport and talk about anything but his trip. They talk about their children and lament about how lazy good for nothing punk kids are today. The trip seems simple enough, like something he’s been doing for years. The ship he’s commanding is meant to bring supplies around the horn of Africa, which, if you didn’t already know this, is not the friendliest place in the world. Nonetheless, a job is a job and Captain Phillips is the definition of salt of the earth. However, what Phillips is about to find out is that this isn’t like any other job he’s had. Captain Phillips is about to get his mojo back. Despite its title, “Captain Phillips” is about more than its captain. Remember, there are also Somali pirates here, and we get a rare glimpse at their fractured homeland. The pirates, who are just teenagers, have a demanding warlord to report to. Greengrass isn’t trying to turn America’s enemies into one-dimensional villains. He also isn’t trying to make them look heroic. Rather, he wants to show that there are circumstances beyond simple greed that lead people to a life of crime. I feel like an old Jewish man could probably turn this into a joke: how does a Somali pirate in a giant boat board a giant freighter? He uses a ladder. Seriously, all it takes for the pirates to get on board the ship is a single ladder that you could probably buy at Home Depot. Once the pirates climb up the ladder onto the boat, the whole film becomes a ticking time bomb. Greengrass is always so cognizant of time and how to use it to build dread. When a character threatens “one minute” until he starts shooting the place up, every millisecond of that minute feels like a frightening eternity. Also, space is so well utilized here, whether it be a boiler room on a freighter or a crammed lifeboat. In “Captain Phillips,” claustrophobia is the name of the game. One problem people might have with “Captain Phillips” is that the pirates aren’t very scary, which I think is exactly the point. These are not professional criminals, but rather a bunch of teens who are forced to grow up too fast. The scrawny Muse (Barkhad Abdi) gets mercilessly picked on by everyone but once he boards the freighter, he is the leader. Or as he says (and now I can’t stop saying to everyone I know), “I am the captain now.” I get a sense that if Muse were a typical American high schooler, he’d probably have a rough few years followed by a great time in college. 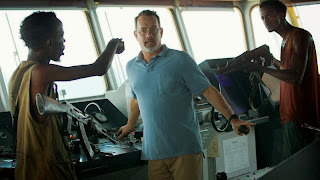 “Captain Phillips” marks a return to form for Tom Hanks, who serves here as both a father figure and a working class badass. Maybe the most distracting part about his performance is that it feels a little bit like a half-assed New England accent. He sounds just like a much nicer Mark Wahlberg. This is some of the graceful screaming that Tom Hanks has done since “Cast Away.” Honestly, I’m surprised that there wasn’t a single scene where Wilson popped out of the water. I guess Greengrass ain’t about those easter eggs. While Greengrass is a master at realism and capturing real time, the slight problems in “Captain Phillips” comes when it feels too much like a movie and not enough like real life. Certain snippets of dialogue should have come with giant flashing letter exclaiming “THEME!” at the bottom of the screen. While the freighter and Somali characters are all very unique, the film enters vanilla territory once the military intervenes. Mainly, there’s a lot of Marines yelling “Alpha! Charlie!” at each other for a really long time. Regardless, “Captain Phillips” is the kind of action movie that can only be released around Oscar season because it actually has a soul. How is it that none of these pirates never need to use the bathroom? I know this doesn’t seem like an important question but seriously, you can’t go that long without peeing or pooping. Just science. If you’ve seen “The Book of Mormon” and that ruined your perception of African warlords, then you’re not alone. Speaking of which, there was also a great “South Park” episode about this event. I was looking back at my notes for the movie and found that I kept writing “Skinny Pete” over and over again. I think Muse reminded me of Skinny Pete because…they’re both skinny. Guys, my “Breaking Bad” is getting bad. I also wrote the word “prepared” in my notes at least five times. “Captain Phillips” is best if you know as little as possible about the true story it is based off of. I love how many rainbows you seem every time water bursts out of the boat. Just a really cool effect. If Robert Zemekis wrote this, then Tom Hanks and all the pirates would be in mo-cap and I would be really creeped out. If Michael Bay wrote this, somebody would put sunglasses on every time something loudly and violently blew up. Also, no one would look back at the explosions. Because science. I also wrote “sitcom” in my notes. I’m not sure why. I guess I thought it would be funny if there was a sitcom where Tom Hanks and a Somali pirate moved into an apartment together. Guys, I’m dumb. Another thing from my notes: “Fonzi.” It comes from a scene where Phillips is combing his hair goatee in the mirror. Well, I mean, Tom Hanks is a really cool guy. The Somali pirates call Phillips “Irish.” I am sick of this stereotyping, people. Just because you’re white and from New England, it doesn’t mean you’re Irish, dammit! This entry was posted in Captain Phillips, Catherine Keener, Movie Review, Paul Greengrass, Somali Pirates, Somalia, Tom Hanks on October 12, 2013 by ian0592.